Words on the window. I only just noticed I spelt la fontaine wrong. Quel dommage! When I was in primary school, my grade four teacher called me windbag because I talked so much. I was always talking, asking questions, interrupting. I was smacked with a ruler for this behaviour one day at school, but it never stopped me from talking. Yet here in France I am often lost for words. During our travels over the past two months we have either been in the UK or in tourist places where English is a second, third or fourth language. Here in France, I am almost (but not quite) silent as I try to remember my six years of schoolgirl French. I can remember words, but not necessarily how to string them together. Par example, I know the word for river, la riverière, but not how to say we are going to the river (nous allons à la riverière). This morning on the way to la filature, we stopped off to fill up the water bottles from la fontaine d'amour. In the garden nearby I saw Tibetan prayer flags hung like washing on lines. I thought of the way prayers and mantras are chanted repeatedly, as if by the speaking of prayerful thoughts, they become words, which become deeds. When children are first learning to read and write, often parents put lists of words on the fridge, on the back of toilet doors, on windows. Please, thank-you, hello, goodbye, bread, cheese etc. I thought of this as I was eating my pain au chocolat with my morning coffee and saw the words all over the paper bag from la boulangerie. I started writing all the words I knew onto pages from the local telephone book which I had to hand. They were the perfect size for prayer flags. I hung them on la fenêtre. Et viola! Now I'm also going to make little chatterboxes with words on them so everyone can read French and English interwoven together. 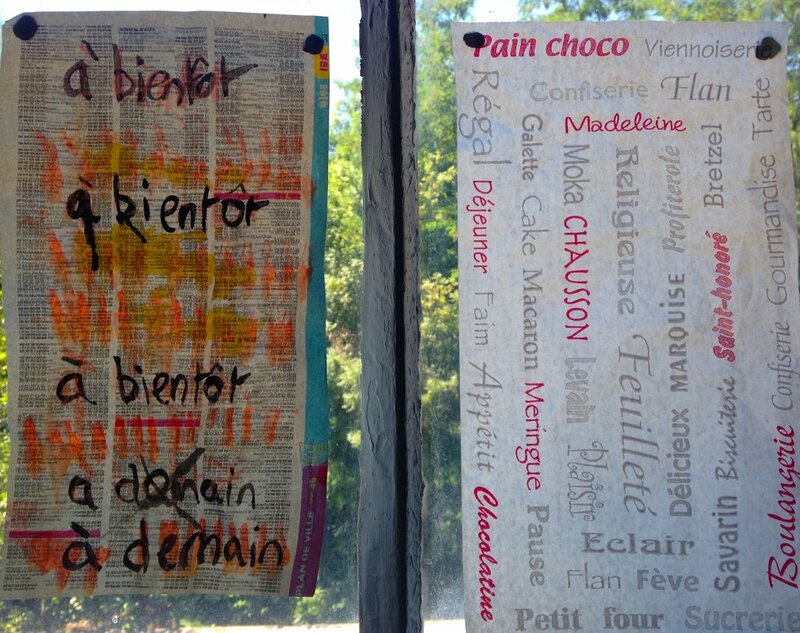 Words I know, words I spell wrong and words on the paper bag from la boulangerie.